A pair of throwback thirds will be return to the NHL this season. 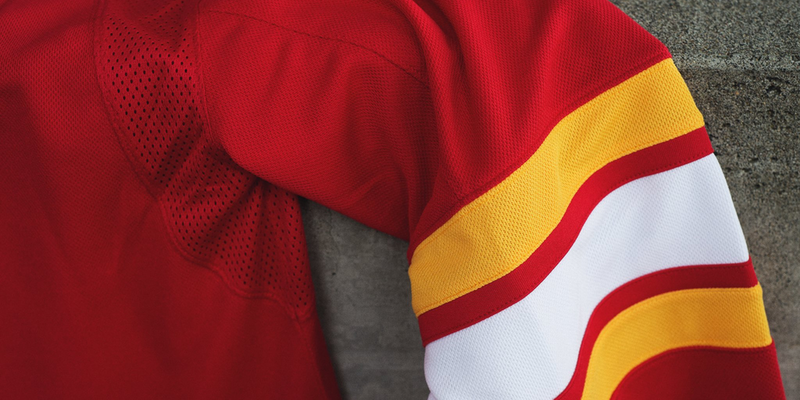 The Calgary Flames and Washington Capitals each unveiled new Adizero third jerseys modeled after their original uniforms from the 1970s and 1980s. 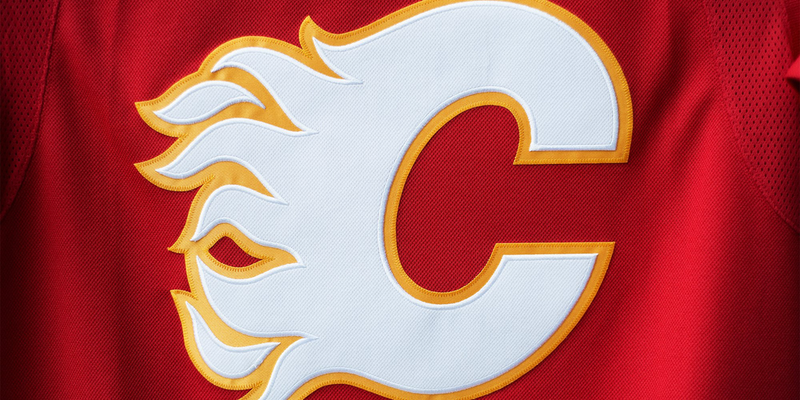 The Flames got us started on Friday morning with their retro jersey. Originally worn from 1980 to 1994, the club resurrected the red and yellow sweater for their 30th anniversary in 2009-10. The following season it was put into regular third jersey rotation until 2013 when they went for more of a Western-inspired alternate. 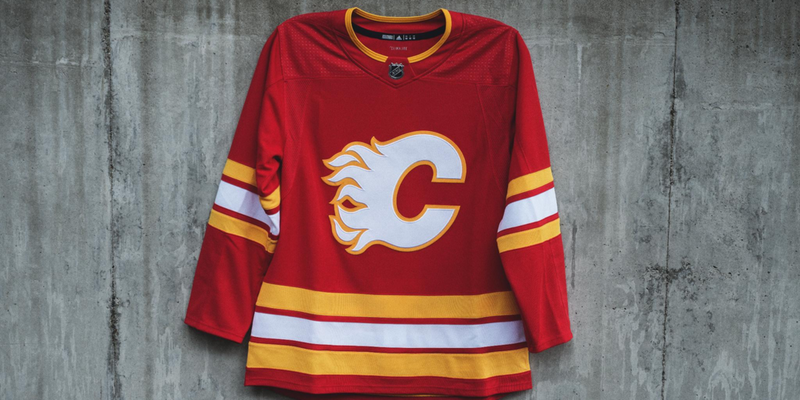 Fondly remembered as the uniform worn by the Flames as they hoisted the Stanley Cup in 1989, the throwback look returned once more in 2016-17 before Adidas and the NHL benched third jerseys for a season. Now it’s back. Then this morning, the Capitals confirmed the return of their original sweater, worn from 1974 until 1995. Unlike the Flames, the Caps never won a Cup in that uniform so I still struggle to understand what makes it so popular. In fact, it was the blue and bronze look that took them to their first Stanley Cup Final appearance in 1998 (where they were swept by Detroit). Still, fresh off their first championship last spring, the Capitals were eager to bring back the ’70s once again. The team originally resurrected the white throwback for the 2011 NHL Winter Classic. It became their third jersey after that. Realizing the logistical problem with a white alternate in a league where the home team wears a dark jersey, they finally switched to the red throwback in 2015. And here we are. Two more jerseys we’ve certainly seen before. I don’t mean to get down on throwback jerseys. I like them almost as much as any hockey fan. The nostalgia factor is fun. But don’t we risk ruining the allure by using them all the time? Why are teams so afraid to move forward and try new things? To date, 13 teams have unveiled new sweaters for 2018-19. Only four of those are new designs — and only two of those utilize a new crest. The other nine are regurgitations. Look, I get that teams don’t like taking risks and prefer bringing back jerseys that are proven sellers, but I just miss the days of seeing something new out on the ice. And it’s hard to really blame the teams here. They’re just playing into human nature. We like what we know. That comforts us. We’re creatures of habit and we don’t like change. I hope the Throwback Era of NHL jerseys starts to wind down. It’ll make bringing them back more of a special occasion. And it’ll mean more options for future throwbacks. All right, I promise to stop whining about retro jerseys for at least a few months. What do you think? Am I way off base here?